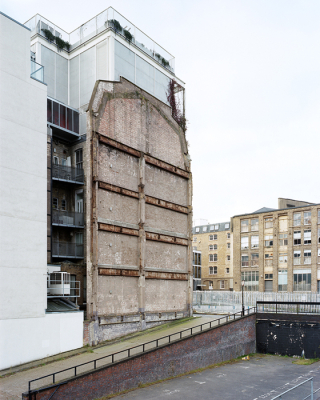 If Jem Southam’s photographs carry with them a sense of the hidden, then Thom and Beth Atkinson’s photographs of London’s ‘Missing Buildings’ carry with them a sense of the obviously lost. Given that the apparent thrust of the work is the ‘documentation’ of Blitz bomb sites, this may sound like stating the bleedin’ obvious, yet as ever the ‘reailty’ is so much more complex and intriguing than it might appear. So whilst these photographs, "made on a series of walks through London between 2009 and 2015” (as the single line of text states in the frontispiece of Hwaet Books’ 2015 publication) may have begun as a means of exploring a specific historical connection (the Blitz) through the fabric of a city, they also inevitably touch on wider questions of loss, remembrance and intervention. In other words, Thom and Beth Atkinson’s photographs may be rooted in the personal (where family history is directly affected by the Blitz), but they use these roots to grow vessels that address the universal. David Chandler’s excellent afterward in the published collection of photographs naturally makes reference to the “historical rupture” wrought by the Blitz but he also hints at the way in which war may be just one (admittedly cataclysmic) means by which cities change. Certainly Thom and Beth Atkinson’s photographs explore this in a subtle and perhaps intentionally, casually underhand manner. For these photographs are not all of Blitz sites at all, or at the very least not necessarily of the absence that remains. The absence in these photographs may be traced directly to 1940s Nazi ordinance but equally they may not. Fact and fiction intertwine to weave a narrative that is real, not real. Meaning becomes lost in the fog of decaying communal memory and new versions are re-written and distributed. What is crucial too about these photographs is that they are beautifully made images. They may be as different from Jem Southam’s as you could imagine in terms of subject, yet they are filled with a similar elegance of light and subtle vibrancy. One of my very favourites is 'Kiffen Street, Shoreditch’. Here the ghost of a building is left staining the brickwork of its remaining gable, whose pink vibrates deliciously against the pale ice of a flat sky. Shining glass and steel rises behind and above it, yet there, just glimpsed, are the windows, doors and balconies of the ghost building’s brethren. They nestle in the shadow, looking out onto the void, turning their backs to the present and the future. You cannot help but look at this photograph and see, not a remembrance of the Blitz, but a nod towards the conflation of what has gone before and what might be inevitably yet to come. You see old and new, established and incoming. Perhaps there is conflict but there is also understanding and acceptance. There is loss and absence but there is also growth and presence. Thom and Beth Atkinson's photographs then are inevitably a commentary on the way in which our landscapes are moulded and sometimes maltreated. By bombs, by war, by individual, government or corporate intervention (where intervention is a proxy for greed, perhaps). But equally they are photographs that recognise that nothing is as simplistic as we might at first assume. Depending on your reference points and personal context, CUFF’s ‘Private View’ may just be the most obscure entry in this entire 50/50 series. If it is a song that is new to you then I envy you the pleasure of listening for the first time. Should you come away from that experience anything less than exhilarated and with the determination to spin the song again, then you have no soul that yearns to dance. Either that or you have a distaste for Pop that goes ba-ba-ba-ba at regular intervals and is hooked around a discordant disco grooviness of mangled guitars. Which, frankly, is your loss. However, for lovers of Pop that goes ba-ba-ba-ba at regular intervals and is hooked around a discordant disco grooviness of mangled guitars then ‘Private View’ is surely one of the finest hidden treasures out there. Released on a 7” black vinyl record with a hand-screened and folded card cover in a plastic bag, it is everything that Pop ought to be in its most awkward, head tilted just-so and eyes coyly but fiercely proclaiming love and hate essence. It is a record with clear Pop lineage, casting back to the brevity of '50s rock’n’roll explosive rawness via ‘60s POW! Pop Art, ‘70s Punk HOWL of DIY independence, ‘80s lets-celebrate-awkwardness indiepop and ‘90s chuck-it-all-together-and-see-what-sticks melodic melange (was that even a ’thing’? Probably not and assuredly WHO CARES?). ‘Private View’ is FUN. ‘Private View’ is FRENZY. ‘Private View’ is CAPS LOCK ON and heartbeats up love. AGAIN. Until the razor cuts, after the Razorcuts. Nods, winks, snogs and furtive fumblings. Pop in the bedroom. A private view. Naturally. Speaking of lineage, you probably do not need to know that CUFFS was Andrew Churchman, previously of Pants Yell! fame, to enjoy ‘Private View’, but maybe it helps. For Pants Yell! were surely one of the great lost groups of the naughties. Once I said they reminded me of Jesse Garon & The Desperadoes and really that ought to be enough for anyone to sit up and take note. The reality probably was that everyone who recognised the value in that comparison at the time did sit up and notice. All ten of you. Cue self-deprecatory laughs. It’s funny because it’s true and all that. Pants Yell! also had the good taste to call their debut album ‘Alison Statton’ (we’re preaching to the converted here, right? You don’t need to be told why calling a record ‘Alison Statton’ is a sign of sophistication do you?) and to record a sublime version of Jens Lekman’s ‘Tram no. 7’. Is it irony then that CUFFS’ single is much more of a YELL than Pants Yell!? Perhaps, perhaps not. Connections are there to be made, broken, taken apart and reassembled in new ways after all. Didn’t Wire say something about that in the ‘70s? Nothing is New but everything can be new. This is the beauty of Pop after all. Pop that goes ba-ba-ba-ba at regular intervals and is hooked around a discordant disco grooviness of mangled guitars. As though there were any other kind.